1. Take your pieces and place them on the fabric so that both straight edges of the dress pieces are on the fold. Depending on your fabric you can do this by either placing the first piece and the second piece above and below each other on your fabric. My fabric is a little different. I have a design on mine. 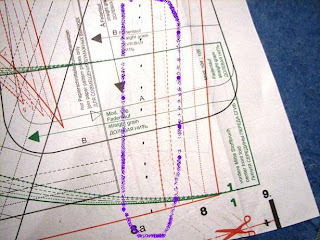 If you do too be sure that the design is centered on the dress pattern before you cut. 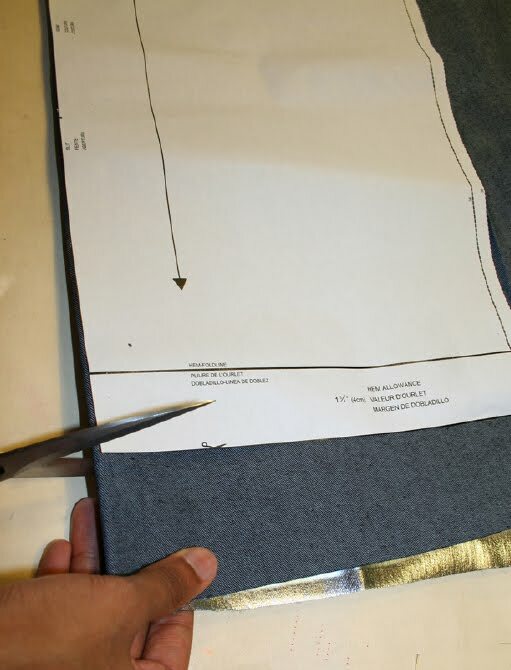 Then take the casing strip and the tie band and place them on the fabric so that you are cutting out two pieces NOT ON THE FOLD. Done....for today. Sew easy, right? The Selfish Seamstress made a great tutorial on Burdastyle about taking in your patterns. Here's the link on burdastyle. And below is a shortened version with her pics on the side. At one corner, measure the distance between sizes. Then mark a new point inside the size 38 outline (or outside the size 42 outline if you're making the pattern larger) at the same interval. 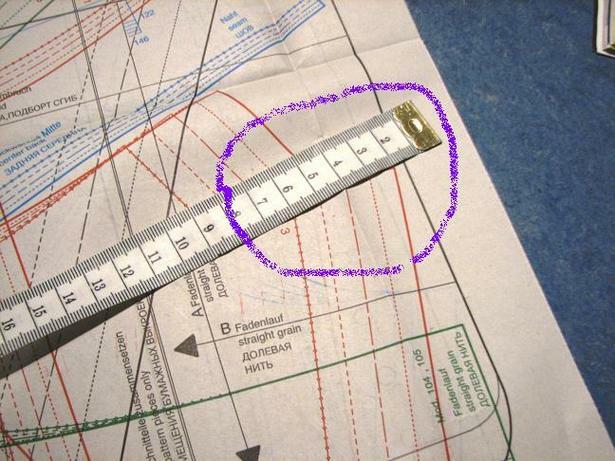 After you have marked all the corners, use a ruler to draw lines to connect the corners along straight pattern edges. For curved edges, you may want to draw some new intermediary points by selecting a few places along the pattern edges, measuring the intervals between sizes, and drawing new points. Today I'll be busy busy busy. So there will be no Tuesday Technique:( And please forgive me if it takes me a little bit to answer your questions. We're having a birthday party for Lily and Molly this evening and I'm doing all my last minute shopping, cleaning and creating today. I'll try to take some good pics to share with you tomorrow. Okay.. I have my fabric and I have cut out the pattern.. so far, so good! Happy birthday to Lily and Molly! I'm excited to see your fabric choice. I looove this one. It's like Frock by Friday: 5 Minutes a Day edition. I keep wanting to click on tomorrow's section! Kind of sad I have to wait a whole day! Also, is anyone else using a knit? Oh Happy Birthday to the girls! My boys bothdays are two weeks apart towards the end of the month. 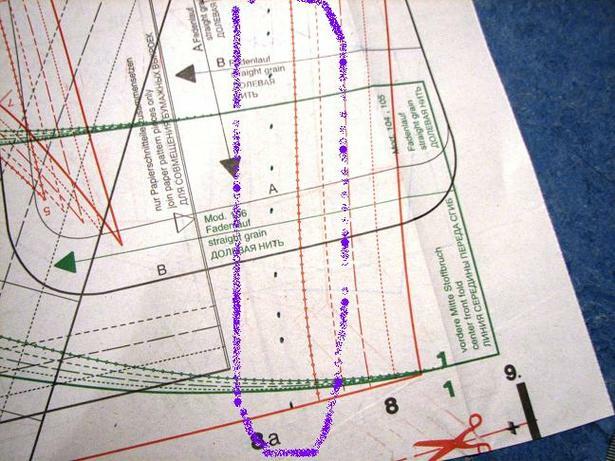 This pattern seems simple enough, I may attempt to draft it using my own measurements. I just read a pattern drafting book from the library, I'd like to attempt it and this seems like a good first pattern to try. I finally got all my sheets together and cut it out last night. Since this is my first dress I'm going to do it in muslin so I can learn about fitting myself properly. So much to learn!! This looks like a wonderful project. Stopping from the hop.